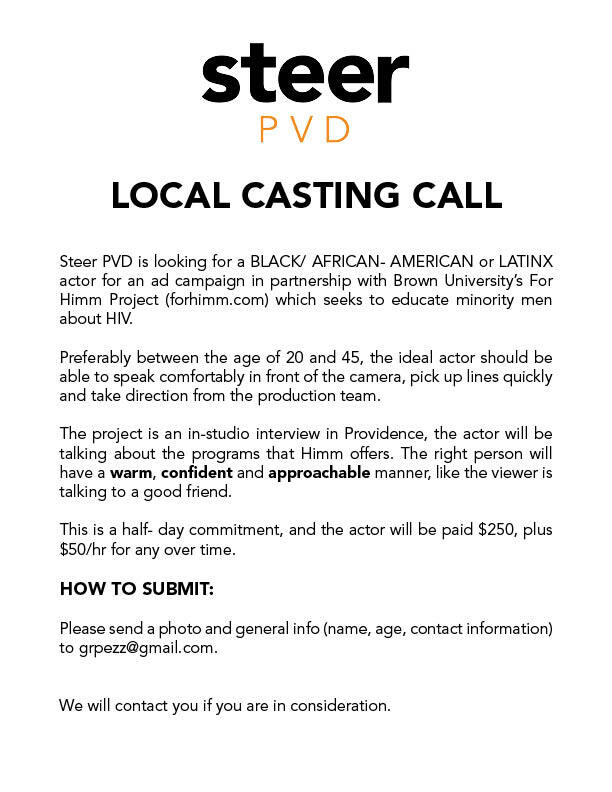 Steer PVD is looking for a BLACK/ AFRICAN- AMERICAN or LATINX actor for an ad campaign in partnership with Brown University’s ForHimm Project (forhimm.com) which seeks to educate minority men about HIV. Preferably between the age of 20 and 45, the ideal actor should be able to speak comfortably in front of the camera, pick up lines quickly and take direction from the production team. The project is an in-studio interview in Providence, the actor will be talking about the programs that Himm offers. The right person will have a warm, confident and approachable manner, like the viewer is talking to a good friend. This is a half- day commitment, and the actor will be paid $250, plus $50/hr for any over time. Please send a photo and general info (name, age, contact information) to grpezz@gmail.com by March 29, 2019. We will contact you if you are in consideration.